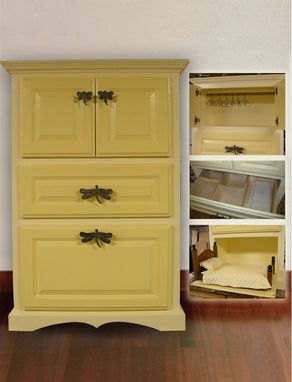 This painted doll wardrobe is the perfect place to house your large doll and all of it's clothes and accessories. Feature a large closet for hanging cloths, a spacious drawer with dividers for shoes and accessories and a drop front door with mahogany bed for your doll to sleep in. Shown in yellow with whimsical dragonfly pulls. Available is a wide variety of colors. Dimensions: 24" x 15" x 40"